Why is it that I always think I can get more done in a day’s time than I am actually EVER able to accomplish? My “Claire Handbag” project is progressing slowly but surely. Such is life when the boys are out of school for the summer…no sense in getting stressed out about it, we just go with the flow! 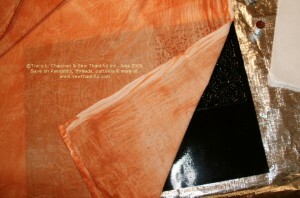 I’m currently in the process of layering multi-colored texture on to the ink-dyed fabric I showed last weekend. This is a process that is best not rushed, allowing surface drying time between layers when necessary depending upon the look you want. Tip: Before you can use Shiva Paintstiks, you must first remove the “skin”. It’s very much like peeling a ripe peach. I use a sharp knife to make a small slit then lift up a corner and gently peel it back. Do this until the top (the entire area you will be using to rub against your fabric) is completely exposed and skin free. Once you have removed the skin, take a paper towel and lightly twist the skinless Paintstik tip into the paper towel to smooth the surface. Now you are ready to rub! Click thumbnail images below to view larger images in a new window. 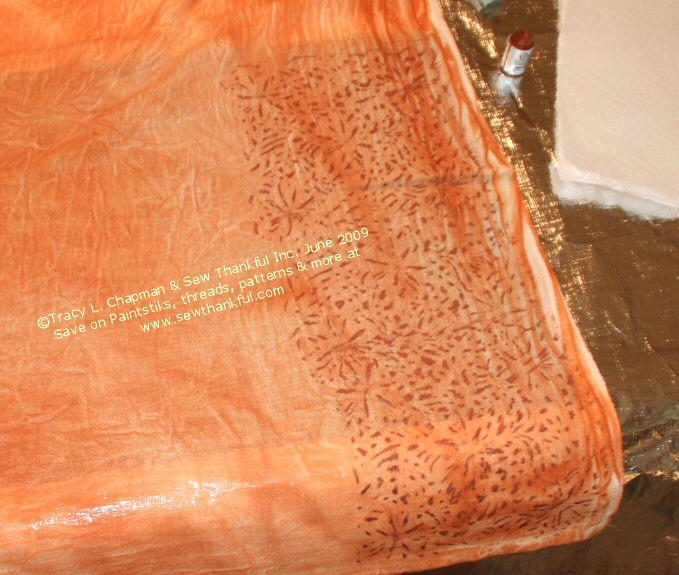 I am using one of the rubbing plates from the Cedar Canyon Textiles set called, Floral Fantasy and an Iridescent Copper Paintstik. I use a Grip’N’Grip no slip mat to hold my rubbing plate in place. You probably can do rubbings without it, but I wouldn’t want to. Rubbing plates sits securely (on the mat) where you want them until you move them when you use the Grip’N’Grip. This little mat saves SO much frustration, it really has earned its keep after only a handful of uses. If you are a visual learner, the DVD is VERY helpful. I have watched it a few times and learn more every time I watch it. I’m still experimenting and learning but I’m very pleased with my progress so far, even if it is on the SLOW side. Stay tuned for more developments.